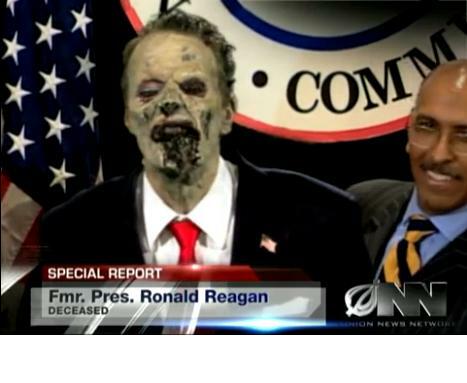 Per the Onion, Republicans re-animate Ronald Reagan after two disastrous presidential campaigns. Better hope the statute of limitations has run out on war crimes. Finally–someone (in the form of Stephen Colbert) called out Bill O’Reilly for constantly bringing up Ronald Reagan in all the discussion of Obama’s reaction to Syria’s alleged poison gas attack. I don’t take Bill-o terribly seriously anyway, but since the memes about Reagan are constantly being picked up, let’s be clear: Reagan inarguably made the situation worse in terms of the world terrorism problem. It was Reagan who built the Mujahadeen to fight the Soviets and compared them to our founding fathers. Among those patriots was a tall Saudi named Osama Bin Laden. It was under Reagan that 241 Marines were killed in Lebanon in a single bombing (the worst day of casualties for Marines since Iwo Jima) and no one ever calls him to account for it. Reagan built up Iraq as a buffer against a radicalized Iran, and the chemical weapons Saddam used against the Kurds were a gift from us. Saddam also killed thousands of Iranian soldiers with poison gas. But we double-crossed the Iraqis by selling anti-tank weapons to Iran(via Israel) as part of Iran-Contra. By the end of the Reagan era, nobody in the Gulf trusted us. But the one thing almost no one gets right about Reagan, the one historical fact that nobody wants to acknowledge is that Reagan stands as our only president convicted of war crimes by a world body. The International Court of Justice found the US guilty of war crimes for fomenting and supporting a war of terror against the nation of Nicaragua, a country we were officially at peace with. The US ignored the ruling, which it said lacked court jurisdiction; when Nicaragua attempted to bring charges in the UN, the US blocked it through its Security Council Veto. Nicaragua is still trying to collect on the damages to its economy and people from the war. Reagan stands as the only president whose administration was ever convicted (by an international tribunal) of crimes against humanity. And official Washington is doing everything it can to make sure that fact is forgotten–that Reagan will keep this honor alone. Obama has fought against any attempt to prosecute W and Cheney (although they were convicted of crimes against humanity in a show-trial in Malaysia), and even though the Tea Party people in Congress are making noises about impeachment, it won’t be over the war conduct of the president. Obama might be pilloried for the ACA, but he won’t ever need to worry about charges of war crimes or violation of the Supremacy clause. The GOP doesn’t have the guts to bring impeachment proceedings over war conduct. Eric–thanks for your comments. One of the reasons I do this occasional series(‘don’t know much about…’) is that I want to have a place where things that go down the memory hole elsewhere can be stated here. And so many outlets that wrote about this when it happened didn’t survive the transition from dead-tree editions to internet. I’ll bet that 5% of American adults know about this, and to me that’s really bad for history AND democracy. The most corrupt administration in U.S. history and they all think he’s a hero. It was one of the more venal administrations in US history, certainly up there with Nixon’s destruction of SE Asia and W’s war based on lies. But I hold his apologists responsible for this–not one American in 50 even knows about this case, thanks in large part to the blandishments of praise heaped on him by the generations that have never been exposed to the information. There’s nothing to get. Ronald Reagan’s administration was convicted of committing war crimes.